Back in action, with new tires. The Evelo Aurora e-bike is back on its feet after I pulled a senior moment and blew out a tire and flatted a tube a week ago. I know, whoop-dee-doo. 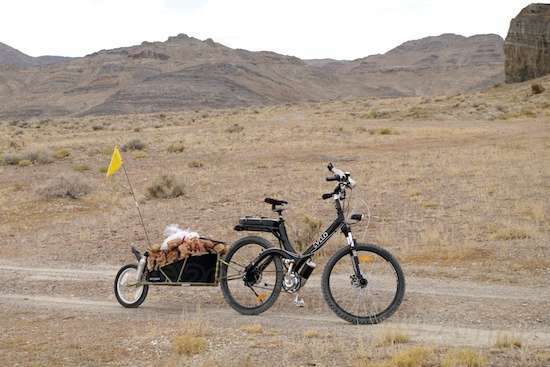 But that downtime underscored just how reliant I’ve become on the e-bike to handle the nine-mile trips toward town for everything from haircuts to idle exploration. Yesterday was the repair and first trash run to discard the old tires and the carton that the new ones came in. The new Michelin Country Dry  (yep tricky name) tires have a series of small lugs all ’round, which puts them right in paved and fire trail territory for intended usage. They recommend 29 PSI for general use, with a maximum of 58 PSI. I put them at about 30, and the ride is predictably cushy over rough stuff. Battery range will probably benefit from higher pressures, but I thought I’d run them low for awhile. Compared to the tall, aggressive lugs on the ancient Maxxis tires the bike had been wearing, they do appear and act different at first blush. They have a slight hum on pavement, but not annoyingly so. 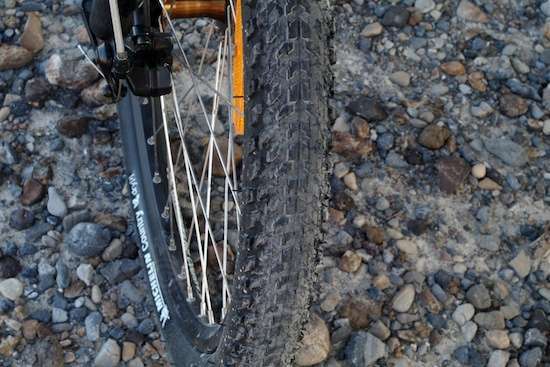 Hard dirt and especially sand feel more secure than the Maxxis tires did, which may prove a godsend on certain trails near Yuma later this year. 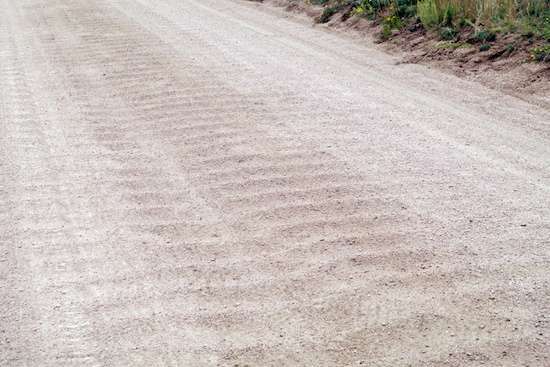 But, they are more prone to side-slip on a sloped mix of loose dirt topped with gravel, or when rolling over loose stones. Once the gravel gets above a certain stone size, there’s no difference. It’s a trade-off I can deal with. 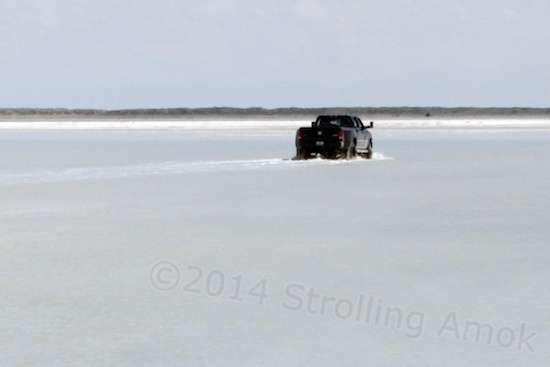 A pickup truck wades out toward the dry part of the salt flats used as the race course. 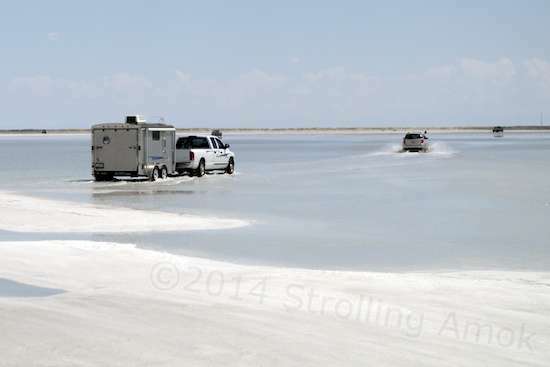 Something I hadn’t banked on from last year’s all-or-nothing weather at the Bonneville Speedway was that part of the salt flats could be dry and usable for speed events, while the rest could be terminally underwater. It’s a fairly common situation, as it turns out. The endpoint of the access road to get there is nicknamed the “boat ramp” for just that reason. Right now, it’s under what I’m guessing is 9″-12″ of water, depending on the path you take. It was much shallower on Friday morning before a passing thunderstorm dumped more water on it. The track area apparently survived, while the entrance did not. The two techniques used: on the left is the wader, rolling slowly through so as to limit splashing of the saltwater. On the right is the impatient hard charger, who must have a rental or leased car, because no one would do this to a personally-owned vehicle, would they? 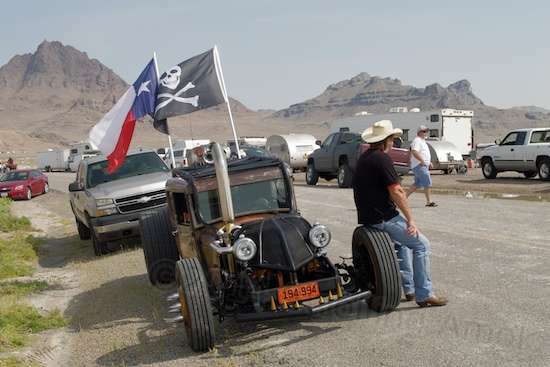 Beginning this weekend and running through Thursday, the Bonneville Motorcycle Speed Trials are taking place. The water entrance hasn’t proven a problem at all for the racers and hangers-on. They just dive right on in with whatever they have. The Defiant, in her secret lair. Another double-length drive through Nebraska got me to the Medicine Bow National Forest in Wyoming, at sunset. To boondock there, you go past the entrance for the Vedauwoo Recreational Area, which is a very nice paved campground and picnic area, with walking paths right up to some of the finest climbing cliffs I’ve ever seen. 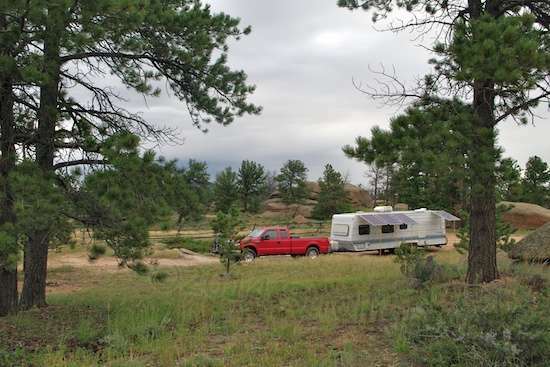 The day use area costs $5/day, and camping (without any hookups) is $10/night. I’m not dead sure any of the spaces will fit the Defiant, but there is some accommodation for larger rigs. After a tour down several miles of the worst washboard gravel road I’ve seen to date, I managed to find a spot to turn around, and wound up pulling into the same area I stayed at last year, but in a position that would limit exposure to mud if the weather turned bad, as had been forecast. It was dark by that time, and quite late, so the evening celebrations were curtailed a bit. This is hardpack, and with a stiffly-suspended vehicle, it’s time to rock and roll. A normal car/truck can skate over this at 30 MPH or so, but the result of doing that with the F-250 and trailer is not so good, at least at tire pressures that will handle the weight. 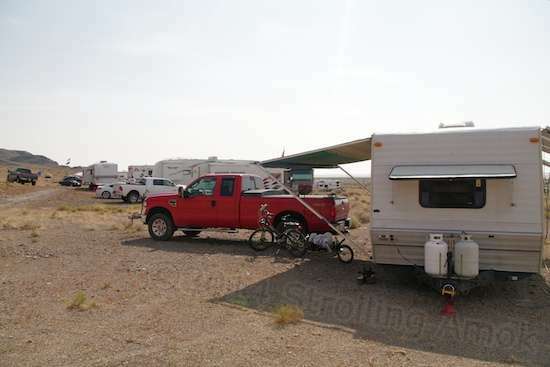 A few miles of this at 1/2 MPH makes the paved fee campsite pretty appealing. This post is a literal continuation of “The Evelo Aurora, Part I” and is incomplete as a standalone article. You will want to read that first to get a more balanced view, if you have not already done so. The Evelo Aurora, suitably optioned. 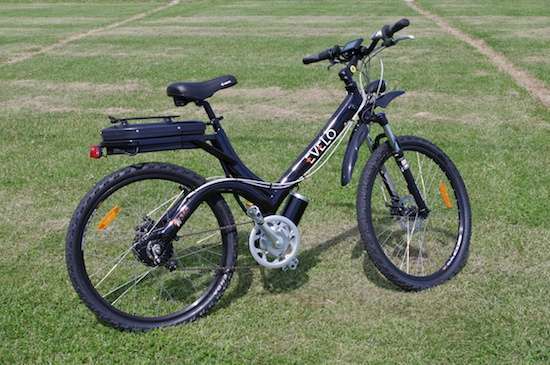 There are only two cautions with the Aurora, traits shared by many e-bikes of this type. First, when you stop pedaling, it will take one second for the sensors to detect this and cut power. I mentioned this earlier. There may be some situations where this may briefly surprise you, until you get used to it. That’s easy. A second trait is more important, and can be more difficult to get used to. 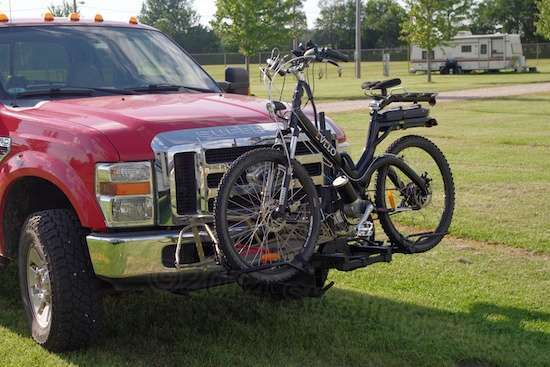 It’s common with a normal bike to coast into a slow, tight turn when maneuvering into a confined area or around obstacles. Then you decide to give it half a pedal just to maintain momentum or help it up a sidewalk ramp, or to take a change in paths. 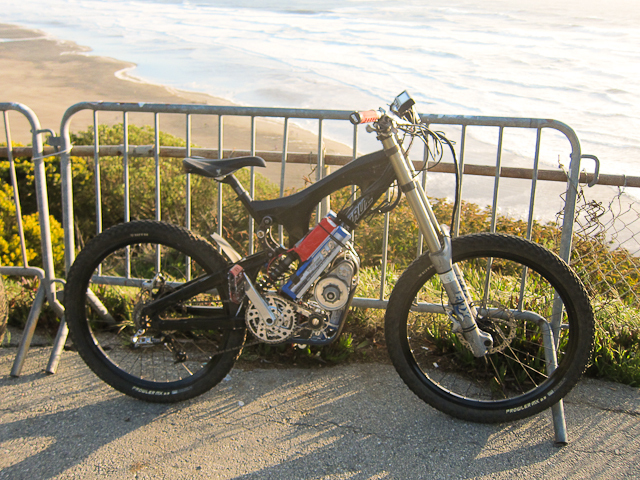 On a pedal-assisted e-bike, this ingrained effort to keep things just right is a bad idea, because the motor will dutifully kick back in at whatever assist level you left it set at. This can be exciting, especially if you are carefully balanced in a tight, slow turn. The unexpected surge of power will put some wobble in that balance. The good news is that instinctively tapping either brake will instantly cut power, rescuing the situation, however clumsily. If you have a lot of seat time on a conventional bicycle, it can take awhile to “unlearn” this habit and substitute a touch of throttle in place of pedaling. The throttle feel is fairly mushy, so learning to feed it in is pretty easy. If there’s one thing I’m sure of, it’s that no major frame component is going to snap off anytime soon. The ample welds are of good quality. Even with the momentary hitch in ordering my Evelo Aurora due to a frame color change, the bike arrived via FedEx six days after ordering – not all that bad. 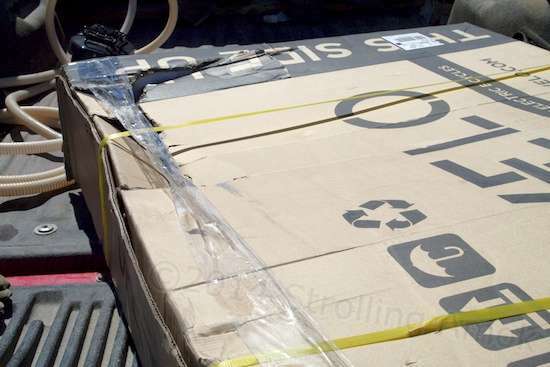 It shipped partially disassembled in one carton, a carton which showed signs of manhandling. It was punched through in a non-critical area, but I was still understandably concerned that something might be bent by the lack of finesse in handling the 70-pound monster. Evelo added my comment to the roster, and told me that they are already in the process of upgrading their packaging to thwart the gorillas. It’s obviously in their own best interests to limit the risk of damage. Off to a worrysome start. 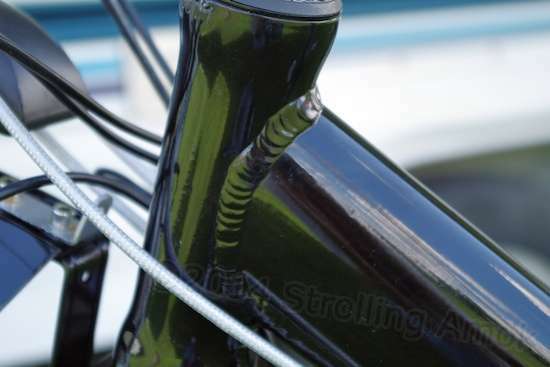 But my concern was groundless, as the only damage was elsewhere, a few minor paint scuffs in the bike’s shiny black rear rack frame. I’d be doing worse to it, in time. The bike comes almost ready to go, and all you need to do is mount the front wheel, stick the handlebars on, and screw in the pedals. There are no tedious adjustments that involve functionality. 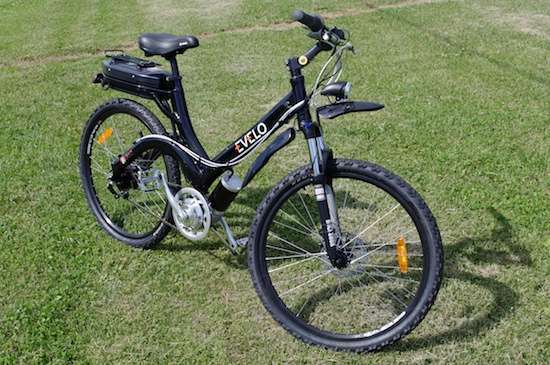 The needed tools are supplied with the bike, along with a basic assembly and user manual. For those who dislike following printed instructions, Evelo promotes viewing their online assembly video for each model.